The Women of Influence Luncheon Series provides opportunities and a venue for women leaders to network, share their best insights and business practices, and foster connections with others. Each quarterly luncheon will address a particular key issue and solutions to women's advancement. While Rachael has always had artistic interests, her original career was in physical therapy. When she finally discovered cakes as a creative outlet, her passion only grew. In 2006, she started her own company, Intricate Icings Cake Design. Rachael's work is now nationally recognized in both the wedding industry and the cake decorating community. Her work can be seen on episodes of Food Network Challenge as well as in the pages of magazines such as Brides, Martha Stewart Weddings and The Knot. Rachael has been awarded several top honors including being named one of Martha Stewart Weddings' top pastry pros in the country. Rachael's work is nationally recognized in both the wedding industry and the cake decorating community. Her work can be seen on episodes of Food Network Challenge and The Today Show as well as in the pages of magazines such as Brides, Martha Stewart Weddings and The Knot. 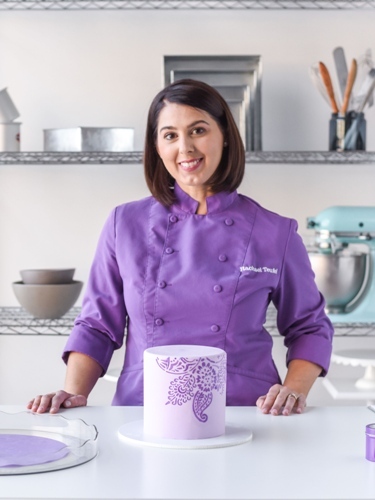 Rachael has been awarded several top honors including being named one of Martha Stewart Weddings' top pastry pros in the country and Brides Magazine's "Top 100 Bakeries”. Brides Magazine has also featured Rachael's cakes in the "50 Most Beautiful Wedding Cakes" and "America's Prettiest Wedding Cakes." Rachael grew up baking in the kitchen with her Hungarian grandmother, but she didn't discover her passion for cake decorating until later in life while seeking a creative outlet from her day job. Hear more about her journey, the struggles she faced, and her giant leap of faith that lead her down the path of success. Note: Gluten free pasta is available for both entrees, but there is possible cross-contamination with gluten-containing products. Come and join us for lunch and be inspired! Please note: There are gluten free options on both meals available. Please specify in the comments. There is possible cross-contamination on the gluten free options, so is not guaranteed gluten free for those that have celiacs.